Any way you look at it, iPad mini is just incredible. And the stunning Retina display is only the beginning. With a new A7 chip, advanced wireless, and powerful apps - all beautifully integrated with iOS 7 - iPad mini with Retina display lets you do more than you ever imagined. Feature for feature, it's identical to iPad Air in every way. Except for its super-portable, hold-it-in-one-hand, still-just-right mini size. Now iPad mini looks even more brilliant in your hand. The Retina display has over 3.1 million pixels - a million more than an HDTV. That's a 2048 x 1536 resolution, four times the resolution of the previous-generation iPad mini. In fact, the pixels are so close together, your eyes can't distinguish them. So photos and videos show incredible detail and text is razor sharp. Because the best pixels are the ones you never see. iPad mini is powerful, but not power hungry. Even though it's up to four times as fast as the previous-generation iPad mini, it still gives you the same incredible 10 hour battery life.1 That's because the A7 chip isn't just more powerful, it's also more efficient. So no matter where you go with iPad mini, you'll have the battery power to go even further. iPad mini gives you up to twice the Wi-Fi performance thanks to two antennas and MIMO (multiple-input multiple-output) technology. 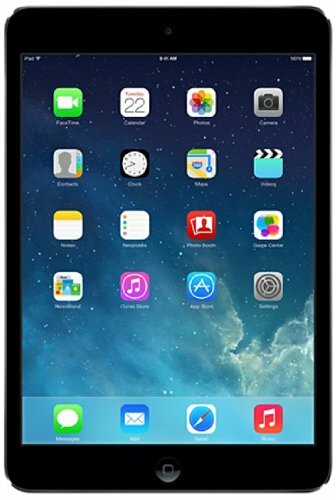 With dual-band (2.4GHz and 5GHz) 802.11n Wi-Fi and MIMO, download speeds can reach up to 300 Mbps - double the data rate of the previous-generation iPad mini.